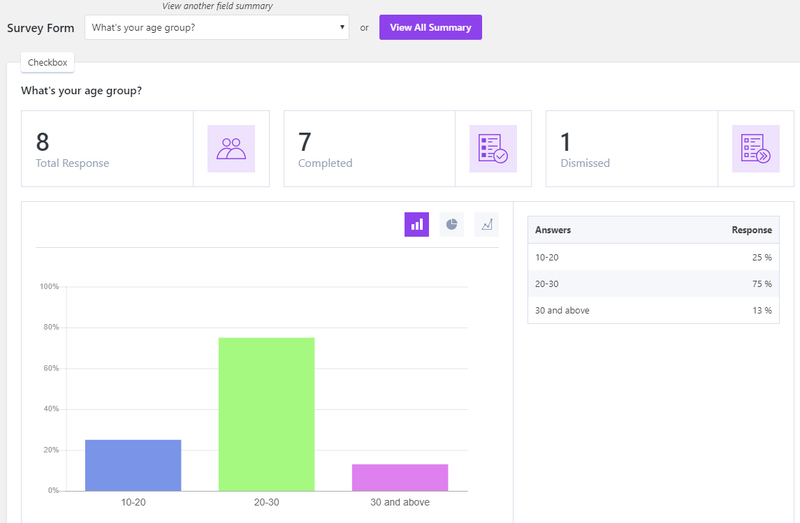 We are excited to introduce to you to our new addon Survey, Polls, and Quiz for out plugin Everest Forms. Adding separate addons for similar tasks can be quite tiring. So, what we have done is compiled survey, polls, and quiz into a single addon for your ease. This simple addon bundle not only streamlines the use of all these features but also combines them together to provide with an unmatchable experience in form building. Since it is a great way to increase the interaction with your website visitors, we decided to come up with the addon as requested by our users. The surveys, polls, and quizzes can be based on your website content as well as general topics. This can be very useful to get the feedback of your website users in a way as well. As mentioned in the name of the addon itself, it has more than one purpose. You can create multiple useful surveys, polls, and quizzes for your form or website. 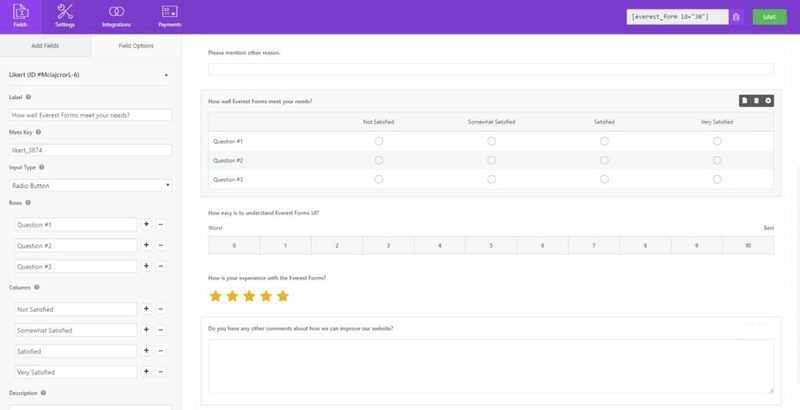 You can add 8 various fields for the survey, polls, or quizzes like checkboxes, multiple choices, dropdowns, Likert, star rating, scale rating, single line text, and paragraph text. Among them, the Likert, star rating, and scale rating are the new fields for the plugin. However, only the Survey is enabled with all the fields. For the polls and the quiz, you can only use the fields checkboxes, multiple choices, and dropdowns. All you need to do is just install and activate the addon. Then, you need to enable the checkboxes for survey, quiz, or polls from the settings panel of the Everest Forms. 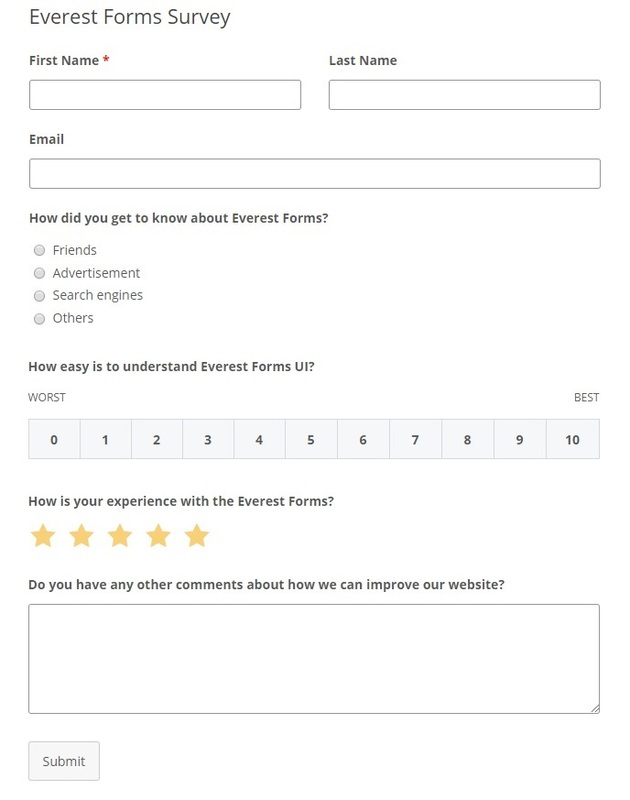 Since this is a premium add-on, you have to purchase our premium plan for Everest Forms. Survey, Poll and Quiz addon is available in our Plus plan and above. For more detail you can refer our pricing page. You can effortlessly start adding the fields for your survey, polls, or quiz. Just use drag and drop to add them from your dashboard. Then you can see the expanded field options for the addon. Just make sure that you enable the survey or quiz for the field options as well. Since a single survey question is also regarded as a poll, the field options for the survey and polls are the same. 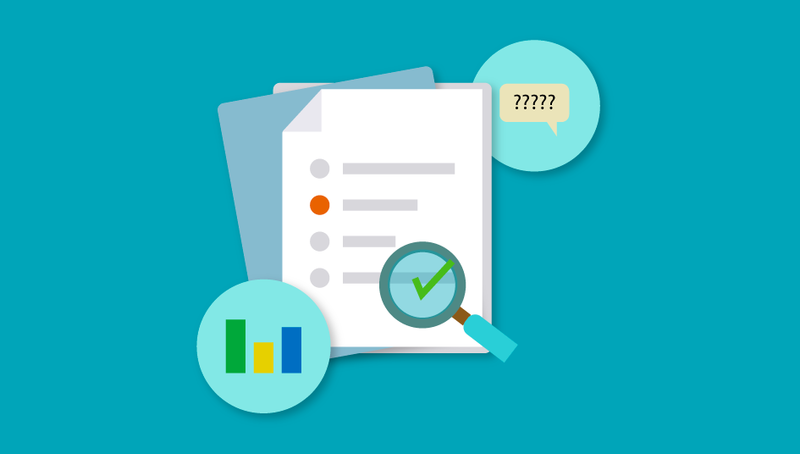 The results and the reports of the survey, polls, or quiz can be shown with all the necessary details you’ll ever need. It has various charts, graphs and percentage comparisons for your survey and polls. For the quiz, you can view the scores of each user along with the correct and the incorrect answers. The feedback can also be shown accordingly. As mentioned at the beginning, we have provided 3 add-ons in a bundle within the same package. This can save a lot of your time and resources as you can easily switch between them or include all of them at once on your website. You also won’t be needing individual add-ons for the survey, quiz, or polls for your website.